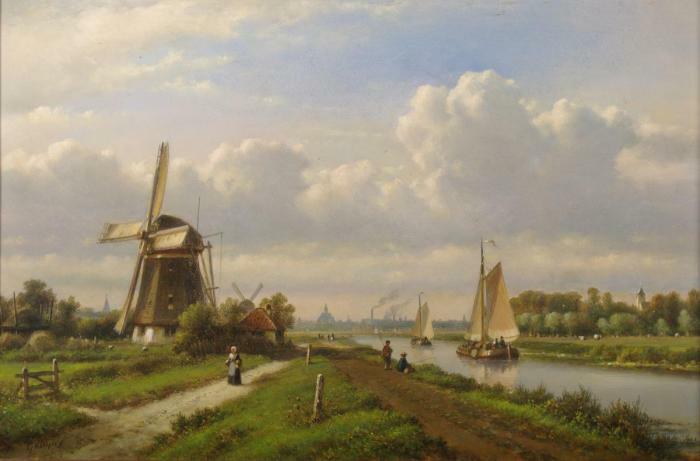 Those who are familiar with the work of Lodewijk Johannes Kleijn will immediately recognize where this typically Dutch scene is located. It is the ‘Trekvliet’ near The Hague, a channel that was made in 1638 as a track boat connection between Leiden, Delft and The Hague. The skyline of the latter is clearly shown in the background. Kleijn often depicted this channel, varying the elements on the shore. The woman and two fishermen on the left are motifs we see in other paintings by Kleijn as well. The verso of the panel bears a pencil inscription: ‘Zomer. Trekvliet bij Den Haag rechts de Binckhorst’ (translated: ‘Summer. Trekvliet near The Hague, the Binckhorst on the right’). Currently the Binckhorst is a well-known business area, but in the past it has been peat land and later a green polder. The tower, hidden in the trees, belongs to the Binckhorst Castle, which still exists and nowadays houses a private clinic for plastical surgery.